Have you heard about the new temporary public art exhibition “Beyond Walls” in Cornelius? The resourceful/innovative/creative Director of the Cornelius Art Center, Jen Crickenberger, put out a national call to artists and asked a panel to select nine finalists whose work is currently on view. Now it’s YOUR turn – you get to vote on the People’s Choice award, which will land the top artist $1,000 and a possible purchase by the Town of Cornelius! 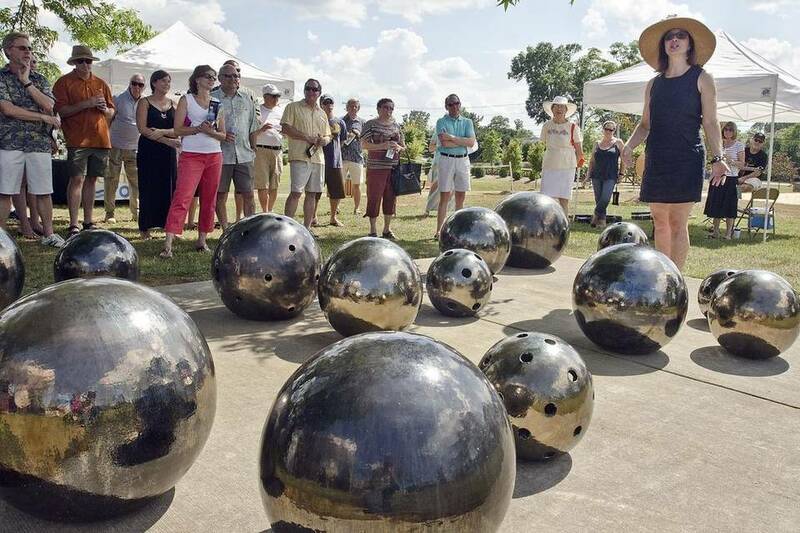 Virginia Scotchie talks about her installation Silver Spheres. Photo by Marty Price.